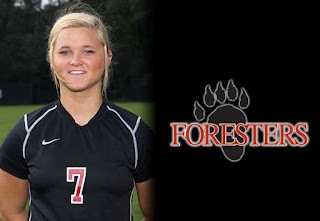 Michelle Greeneway broke into the original top 25 of Illinois Student-Athletes to watch (see Breitbart Sports story above) as a star hockey player for the Lake Forest College women's team. More votes then started flooding in for her, pointing out she was also a soccer star and star in the classroom (second team Academic All-American in soccer). In several states dual football and track stars placed near the top, and Greeneway's skills in multiple sports have now helped her move into first place. Her teammate Holly Lesperance also broke into the top 25 - playing on the same two teams as Greeneway. A Chicago Tribune story covered the two dual sports. Click here for an interview with Greeneway after helping the Foresters advance on the soccer field. Below is the updated top 25 of student-athletes to watch.